According to the 'Vamana Purana', the Varuna and Assi are two rivers that originated from the body of the primordial Purusha. 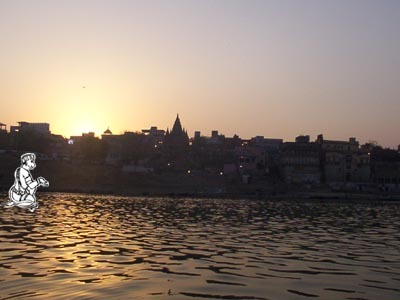 The tract of land lying between the two rivers is believed to be 'Varanasi', the holiest of all pilgrimage centres - a city in existence from time immemorial and that has enlightened many Rishis and Sants . The ante diluvian culture preserved by this great city is the standing testimony to the grandeur of past. The statement that the city is older then any legend is also an under evaluation. Varanasi is the microcosm of Hinduism, a city of traditional classical culture. Glorified by myth and legend and sanctified by religion, it has always attracted a large number of pilgrims and seekers of soul. The city is also known as 'Kasipuri'and the word 'Kas' means to shine. While there were many saints and Rishis who had lived in this city, famous among them are saints of comparatively recent times, namely Sri Goswami Tulsidasji, Sri Kabir dasji, Sri Ramanathji. The works of all these saints are virtually worshipped and are renowned for the philosophical ideas preached therein. However, the work of Sri Goswami Tulsidasji is remembered by many, as the language used therein was easily understood by even a commoner. At the same time, the pundits also found them to be valuable. There will be hardly any devotee of Lord Anjaneya who is unaware of the forty slokas composed by Sri Tulsidasji titled "Hanuman Chalisa". This is the most powerful and popular composition recited by the devotees of Lord Anjaneya the world over. Devotion that this hymn develops towards the Lord is enormous and has to be experienced and enjoyed. If millions could experience the devotion, the power with which the hymn had been composed could be well estimated. His devotion towards Lord Anjaneya is well beyond estimation. This is a siddha grantha and Sri Tulsidasji , a siddha purusha. It is said that whenever Sri Tulsidasji recited Ramayana he used to keep one of the front seats vacant and covered with silk cloth. He used to keep the seat for his Lord Anjaneya who in keeping with the saying "yathra yathra raghunatha keerthanam thathra thathra kruthamasthakanjalim" was sure to come for listening the Rama Charitham. To this day many kathakar follow this practice of keeping a seat for Lord Hanumanji when reciting Ramayana. While he was giving discourse on Ramayana in the great city of Varanasi, he was curious to see Lord Hanumanji in the crowd and everyday he will look forward to have dharshan of the Lord. With the curiosity intensified, one day he spotted a leper sitting in one corner of the crowd who was keenly listening to the story and was totally immersed in the process with a sense of deep devotion to Lord Rama. Sri Tulsidasji understood that he is nobody other than Lord Hanumanji and decided to follow him after the katha was over for the day. Sri Tulsidasji spotted him after the katha and started following him. He was trying to dodge Sri Tulsidasji. Finally after moving some good distance southward towards the place known as Lanka, that was full of jungle, Sri Tulsidasji over took him. And in the firm belief that the person whom he followed was Lord Hanumanji, he got hold of the person's feet and with pranam said "Oh! My Lord Hamumathe! so kind of you to have come to give dharshan to me. I would like to see my Lord in his full glory. Please have mercy on me to give me dharshan of yourself in your own roopa". The leper - none other than Lord Hanumanji - could see the plight of the devotee and composer of Sri Ramayana, and took his original form as Lord Hanumanji. On seeing Lord Hanumanji in his own form, Sri Tulsidasji was immensely happy. After few minutes of dharshan of his Lord he said "having had your dharshan I am relieved of my next birth. Now that I am relieved of the next birth, My Lord kindly help me to have dharshan of Lord Rama during this birth itself". Lord Hanuman smiled at his devotee. With His right hand lifted and with His left hand on His heart said "when time is ripe I will call you to Chitrakoot and help make dharshan of our Lord Rama". Sri Tulsidasji put forward another request to his Lord- that He should bless all those who come to this spot. Lord Hanumanji affirmed that he shall oblige his wishes by giving blessing to bakthas here in the very same place. It is believed that as per the desire of Sri Tulsidasji, Sri Hanumanji has self-assumed (swayambhu) form and gives his blessings to one and all the bakthas coming here with faith. 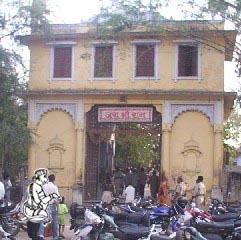 The place is known as Lanka in Varanasi and is very near Banaras Hindu University. A small kutil was built for Lord Hanumanji on the very same spot where the Lord gave dharshan to Sri Tulsidasji. It is a well-maintained secret that the form self-assumed by the Lord here is same as he gave dharshan to Sri Tulsidasji. Lord Hanumanji has his right hand raised, [abhayahastha] and his left hand rests in His heart. Since all the troubles of the devotees are eliminated with the blessings Lord Hanuman of this kshethra the swayambhu Hanuman has come to be known as Sri Sankata Mochan Hanuman. The temple initially was small and with the help of mahants of the time various additions were made and today the temple complex is very well maintained. There are rooms for stay by the devotees who come to the temple on pilgrimage. The Pratha aarati at five in the early morning is well attended. The Rathri aarati is performed to the Lord Sankata Mochan Hanuman at around eight thirty in the night. Before closing the door of the temple the Sayana aarati is performed at around ten in the night. At that time, in the mellow light, to have dharshan of the Lord is a wonderful experience that one can carry through out his lifetime. The temple is closed between noon and three in the evening after bhog. On Tuesdays and Saturdays akant nama sangeerthanam, manaspat especially Kishkintha and Sundera Kand are chanted. On the day of Karthik Krishna Chathurdhashi special prayers at the time of Suryodhaya are held. On Chitra Sukla Poornima day, the Mahotsav of the temple is held and during that time many tableaus are taken out in procession. Many workshops on Ramayan, virat sangeet are held for four days during the same period. Next time when visiting Varanasi, do have dharshan of the Lord in the form of Sri Sankata Mochan and get rid of all the troubles the are afflicting you and offer your gratitude to Sri Tulsidasji for making it possible.